On 6 May 2010, H.E. Mr. Ban Ki-moon, Secretary-General of the United Nations gave an impassioned speech at the United Nations at an event organized by Parliamentarians for Nuclear Non-proliferation and Disarmament (PNND) and the Inter-Parliamentary Union (IPU) on “Advancing Nuclear Disarmament: The Power of Parliaments." (L-R): Raphael Chegeni, MP (Tanzania), Edine von Herold, MP (Costa Rica), Alyn Ware (PNND), Secretary-General Ban Ki-moon, Ambassador Anda Filip (IPU), Nicky Wagner, MP (New Zealand) and Jonathan Granoff (GSI). Other speakers on the panel included IPU Permanent Observer to the United Nations Anda Filip, PNND Co-President Raphael Chegeni MP ( Tanzania), PNND Council Member Edine von Herold MP ( Costa Rica), PNND New Zealand Deputy-Chair Nicky Wagner MP ( New Zealand) and Global Security Institute President Jonathan Granoff. 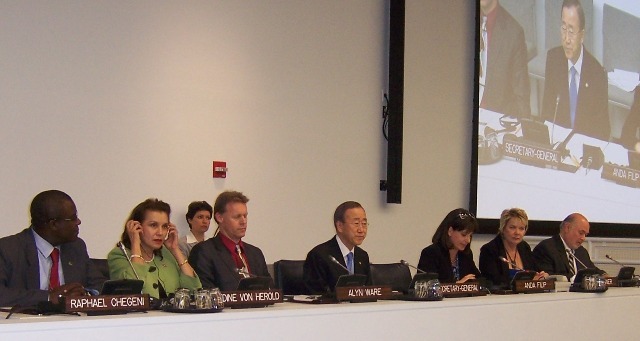 The event was held in order to bring the voices of parliaments and parliamentarians to the government delegations and non-governmental observers at the 2010 Non-Proliferation Treaty Review Conference, and in particular to urge progress on the UN Secretary-General’s five-point plan for nuclear disarmament – which includes the call for a Nuclear Weapons Convention. Mr Ban noted that “Ten years ago, the NPT Review Conference described the total elimination of nuclear arsenals as “the only absolute guarantee against the use or threat of use of nuclear weapons.” Mr Ban urged parliamentarians and civil society to “take that message back to your capitals and your governments,” in order to ensure that the NPT Conference takes definite action before it closes on 28 May. Written text of his speech is at "UN Secretary-General Ban Ki-moon - Advancing Nuclear Disarmament: The Power of Parliaments." a compilation of resolutions adopted or pending in national and regional parliaments supporting the NWC and/or the UN Secretary-General’s five-point plan on nuclear disarmament. The documents were also distributed to government delegations and NGOs attending the 2010 NPT Review Conference.